This is the new and improved Hiblow HP100LL. This new design includes improvements for longer lasting diaphragms over the standard HP-100 model. The Hiblow HP-100LL fits many 600 & 750 Gallon Per Day units as well as several other 500 gallon per day aerobic systems. The Hiblow HP-100LL is a compatible replacement for the Hiblow HP 100, Gast SPP-100, Thomas 5100, Medo LA-100, Secoh EL-100, and many other 100 LPM units. Below are some frequently asked questions about the Hiblow HP-100LL Septic Air Pump. If you have further questions, call our customer support staff toll free at 1-877-925-5132 or email sales@septicsolutions.com! Yes. The Hiblow HP-100LL comes with a standard manufacturer's warranty of 1 year, as well as an additonal year of coverage by Septic Solutions because this item is included in our Whale of a Deal program. Every Hiblow HP-100LL purchased from Septic Solutions is covered under warranty for 2 years from the date of purchase. The Hiblow HP-100LL air pump is designed to be used with 1/2'' ID airline or larger. It comes with a rubber 90 coupling connector and hose clamps. 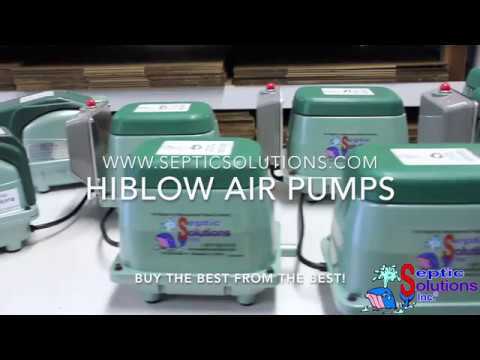 Which size Hiblow septic air pump do I need? See our air pump crossover guide below. All of the equivalent models are shown down the columns, with each row representing the brand.